Looking for more than just a chainsaw? 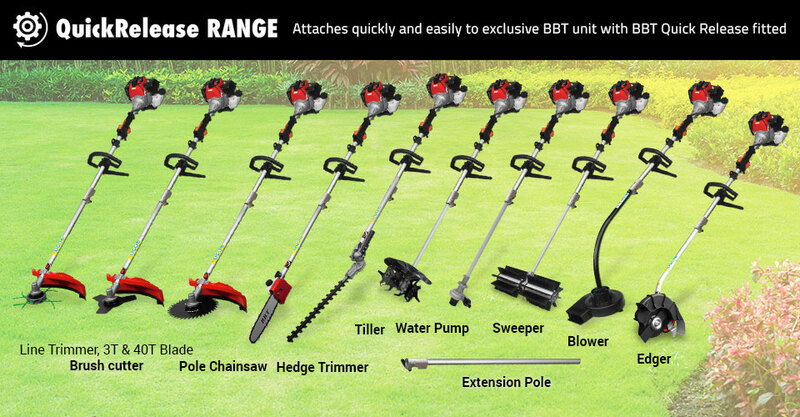 With the BBT 4-Stroke 6-in-1 Multi Tool you get a pole chainsaw plus a hedge trimmer, brush cutter and line trimmer. Perfect for any application, whether for the weekend gardener or pro, this 6-in-1 Multi Tool will keep your gardens neat and tidy. This great Multi Tool covers it all, with a hedge trimmer, pole chainsaw, brush cutter and line trimmer. You simply undo the BBT quick release, insert your desired attachment and away you go. The BBT Multi Tool has a commercial grade 36cc 4-stroke engine. It’s engineered to last with heavy duty pole but it’s only weighs 8kg dry. We have built this great Multi Tool to meet a standard not a budget. A high quality Oregon chain is included. Not only do you get all 6 tools, we have optional extras that will fit the BBT multi tool! These include an edger, tiller, sweeper, water pump and blower, making it one of the most versatile tools on the market today. This Multi-Tools appears to be a good buy. Well built, solid and each component seems to have been designed for purpose. This Multi Tool 6-in-1 is as good. This Multi Tool 6-in-1 is as good as the last 2 stroke 5in 1 I bought over 10 years ago from BBT and it is still working. I just wanted to upgrade to a 4 stroke engine and it is brilliant. I wrote my first review on this product on 1/12/16. Since then it's been used fairly constantly at home and my garden care business. Is it as good as my old Honda? No. Has it done everything I've asked of it, including a lot of heavy work? Yes it has. Is it about $500 cheaper than my old Honda. Yes, yes it is. I recommend this product, it's tough and does the job. Set it up as soon I received the product and put it to work. I've only used the line trimmer and finished my half an acre block without even changing the line once. Yet to try out the blades and hedge trimmer but it seems pretty solid at the moment. The machine was easy to assemble and started 2nd pull. Yet to put it to any hard work, but the little it has seen it has performed well. Looking forward to getting it amongst it with this machine and seeing how it compares with my old Honda. Hoping for the best as it seems a good solid bit of kit. This unit will be doing some serious work over the next few months and I will review again after it had taken some punishment.